15 13/16 x 19 7/8 in. A native of the German city of Bremen, Herman Herzog entered the Düsseldorf Academy when he was 17 years old. The young artist was attracted to landscape compositions and traveled widely in pursuit of inspiration. During the 1860s, the artist settled in Philadelphia but continued to travel, including regular visits to his son’s home in Gainesville. 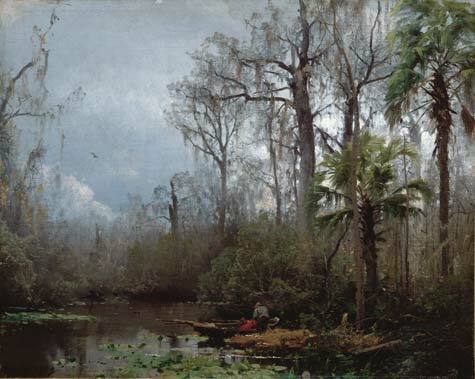 Herzog created more than 250 Florida views of the lush vegetation between the Suwannee and Homossassa Rivers. This painted record of unspoiled Florida was created for Herzog’s appreciation alone without any audience in mind. Financial success allowed the artist to cease selling his paintings later in life, resulting in a studio collection of nearly 1,000 works at the time of his death.